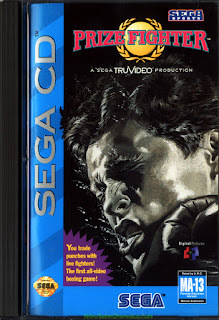 Prize Fighter is a boxing full motion video game released by Digital Pictures for the Sega CD in 1993. In this game you are a boxer know as "the Kid" and you have to fight your way through four different fighters. The game is completely full motion video, including the actual boxing. When you get in the ring you fight as "the Kid" in a first person view, all you can see of yourself is your boxing gloves at the bottom of the screen. The action during the fight is a video displayed inside a smaller square in the middle of the screen with a picture of your face and of your opponents on the bottom that show damage to their faces as they take damage like in Doom. When you fight each boxer a video is played of your opponent in the ring and you need to avoid his punches while you try to damage him. This is the biggest flaw in the game, once you've fought a boxer it's the same video every time after so there isn't much replay value. One of the biggest gripes about this game is about the fighting and for the most part I have to agree. In order to make the game playable at all you need to go into the options and set the arrows to show you where to punch, without it you'll never win. I know it's a bit like cheating but once you do it the game is more fun. Most of the game, including all the cut scenes, are shot in black and white which I'm guessing is to make it look like the movie Raging Bull. As I said you will be fighting four different boxers and before each fight and after each you are shown a video cut scene that while they aren't quite up to Raging Bull standards they are, I think, better than a lot of the cut scenes on the Sega CD. Also because are in black and white the Sega CD doesn't have to work as hard and the videos look better than most of the videos on the system. When people put down full motion video games on the system I point to this game to show that they aren't all terrible. While the cut scenes have a bit of corniness to them they are well done and wouldn't look to out of place within a real movie. Also they had enough money to have Micheal Buffer do the ring announcing. In the end is this a great game? Maybe. I like it but it has little replay value and the fighting can be frustrating, especially if you don't add the arrows. Another issue is you need to level up your fighter before you can take on your next opponent. If you don't he will destroy you no question. The cut scenes are pretty good and are probably the best part of the game. I would rate this game a 6 out of 10.